According to the statistics collected by ophthalmologists, every second Russian has an eye problem whatsoever. And worldwide the number of people suffering from myopia, hyperopia, astigmatism, cataract, retinal disorders and other eye abnormalities and disturbances will make at least 30 per cent of the population. And sadly this number is increased annually. The reasons for this tendency are numerous: genetic predisposition, ecology issues, improper way of life, excessive use of computers, as well as irregular visits to ophthalmologists. And the eye doctors keep saying: eye problems prophylactics is a sure way to secure future complications. Even those who have never worn spectacles and have no obvious eye problems should come for the visual system checks al least twice a year, as there are some eye deceases that develop symptom-free, therefore some may have for a long time no clues on a building-up eye problem. In case of an eye injury. At Excimer Eye Clinics a visit to an ophthalmologist starts with a comprehensive visual system test. 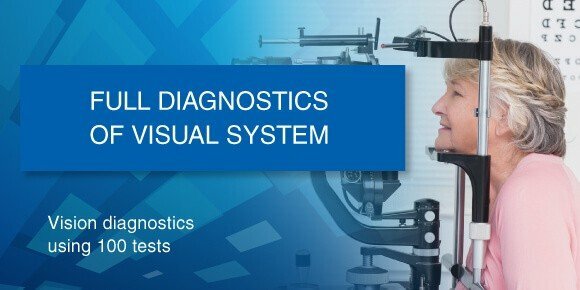 The diagnostic includes checks allowing to determine not only the vision acuity but in addition to test functional and anatomic features of the visual apparatus. Such detailed vision testing allows the doctor to investigate the cause of inferior vision and to determine the best treatment procedure should it be necessary, individually in every case. This check is performed in one day and creates the complete picture of the patient’s vision, providing doctors with excessive information essential for a decision on the individual treatment procedures and the post-treatment control, if any. It is very important to remember that no eye disorder an be diagnosed by one self. One is risking his health when not addressing the problem to an ophthalmologist! Do not go for self-treatment! Dr. Kirill Pershin - The leading ophthalmic surgeon, Board Certified Highest Degree in Ophthalmology, MD, Professor, Member of Russian Academy of Natural Sciences. CMO EXCIMER Moscow Clinic Dr. Nadezhda Pashinova Board Certified Highest Degree in Ophtrhalmosurgery, MD, Assistant Professor, Member of Russian Academy of Natural Sciences. CMO EXCIMER St.Petersburg Clinic Dr. Yevgeny Gurmizov Board Certified, Highest Category in Ophthalmology, PhD. CMO EXCIMER Novosibirsk Clinic Dr. Vladimir Kashnikov Board Certified Highest Degree in Ophthalmology, MD, Member of Russian Academy of Natural Sciences, Member of Russian Academy of Medical and Technical Sciences, Honoured Doctor of Russian Federation.